Our Ochers come from the last remaining company in Europe to mine deposits in the French quarries of Gargas and Rustrel, nested in a twelve-mile long enclave in the heart of the Luberon Mountains. Also known as Ocher country in Provence, these deposits have been registered by the Government of France as protected and classified Natural Sites. Ocher (from the Greek word Okhra, meaning yellow soil) is naturally occurring clay in a symphony of colors ranging from pale yellow through oranges to an intense red. But ocher must go through several important steps to become available for use. 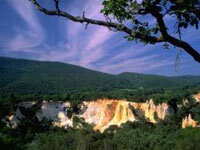 First, the ore must be extracted from the cliffs in the quarries. The ocher is then separated from the sand using water and centripetal action for this cleaning procedure. 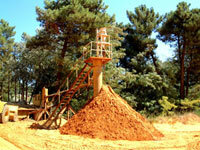 The Ocher is then dried in the open air from spring to Summer before being stored. Some colors will undergo calcinations. 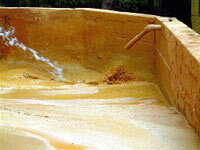 For example, raw yellow ocher is heated at high temperatures to obtain red ocher. Mixing different ocher pigments extracted from diverse veins creates our unique and exclusive range of colors offered. They are then pulverized and packaged for your use. 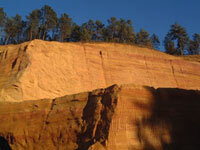 Ocher extraction at the Luberon quarries is a well-controlled mining process, paying strict attention to our environment. Air pollution is prevented by the use of dust removal devices installed in the factory's chimneys to clean the smoke before it is released into the air. 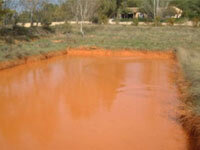 A high volume of water is necessary to clean the ocher. Running in closed circuits allows for cleaning and recycling of this water. 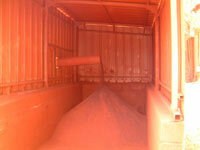 The separated sand, when not sold for different purposes, is returned to its original site. Extraction is done by machine, employing the technique of terracing to maintain structural integrity. 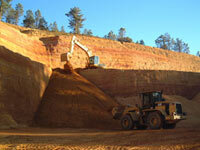 Mined sites are then rebuilt with their original top layer of soil. This page was excerpted from the book Ocher, Colors of Provence by Jean-Michel Steber. Printed by Rimbaud-Cavaillon, France. Used with permission of the author. Photography courtesy of the Guigou Family and Jean-Michel Steber.